We're happy to announce that Azubu TV is now officially a live streaming partner of XSplit Broadcaster 2.0. Azubu TV is a premiere eSports network delivering live and on-demand eSports action, programming, news and analysis. The new streaming plugin will make it easier for you to stream to their service. 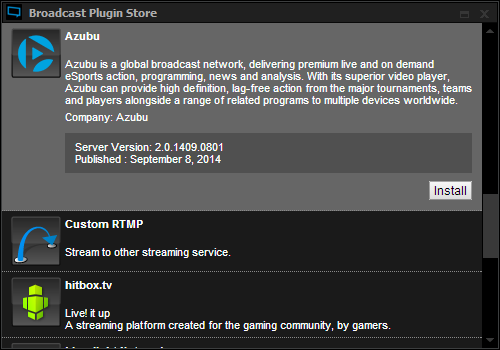 Here’s a quick tutorial on how to go live on Azubu TV. You can apply to be an Azubu broadcast partner here. You will now be in the Broadcast Plugin store. Scroll down to the Azubu plugin and click install. a. You can find your Static Key in your Azubu dashboard under the settings tab. For Video Encoding, it is recommended to use the “x264” Codec. The codec produces a high image quality with less bandwidth requirements. The Bitrate you choose will depend on your selected resolution, computer hardware and internet connection. If you want to use a high resolution you will need to have powerful computer hardware and high internet upload bandwidth. 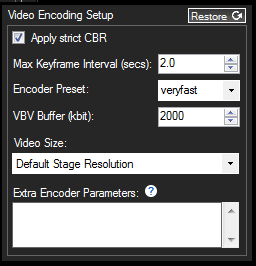 To simplify things when choosing your Resolution and Video Encoding Bitrate, you can start by setting your Resolution to 360p (View > Resolution > 640 x 360 (16:9)) and your bitrate to 700. Do a test stream and see how your computer handles it. If CPU usage is low and your gameplay isn’t affected, then try the next highest resolution and bitrate. 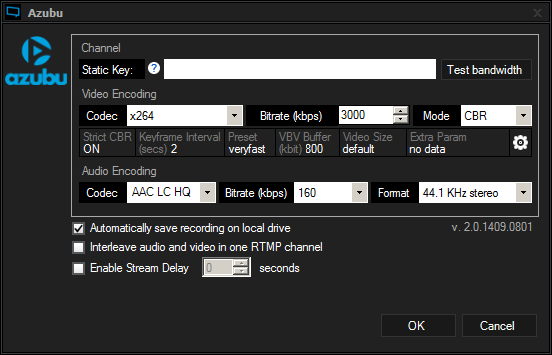 Once your performance starts to suffer, simply go back to the last resolution and bitrate that worked well for you. Note: These values are based on using a frame rate of 30. The extra encoding parameters do not need to be changed unless you wish to stream at a lower resolution than you’ve set XSplit to. This can be changed in the video size drop down menu. Congratulations! You’ve now configured your Azubu channel! Click OK to exit the Channel Properties window. To start a broadcast, click on your channel in the Broadcast menu. You’ll see the top of the XSplit Broadcaster window begin to display encoding information. We would like to thank the cool folks over at Azubu for making it easy for us to optimize XSplit Broadcaster for their amazing service. If you have any questions or feedback, then please let us know in the comments section.